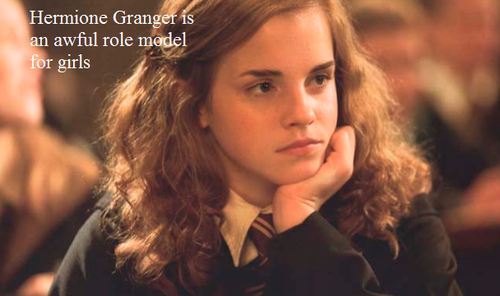 Hermione is an awful role model. spoof confession. Wallpaper and background images in the Harry Potter Vs. Twilight club tagged: harry potter hermione granger role model. This Harry Potter Vs. Twilight fan art contains portrait, headshot, and closeup. There might also be mahusay bihis tao, suit, pantalon suit, pantsuit, and business suit. What? Why? She is strong, clever, resourceful, doesn't need a man, independent and will always fight for what she believes in. Plus, her character shows it's okay for a girl to be clever, they shouldn't rely on men and it's okay not to be stunningly beautiful. ^ what Book-Freak said pretty much summarises my argument. Hermione taught me that people will ridicule and discriminate you but that doesn't stop you from fighting for what is right, that you don't need a guy to be happy and succeed in life. You shall burn in hell forever muggle!!!!! Guys, if you read the description it says 'spoof confession' meaning it's a joke.